Last week, Toronto based MaRS and NCCC member InnovationQuarter signed an MoU, signifying the start of a collaboration. The two organisations will explore options for setting up a market expansion programme in support of cleantech businesses looking to set foot on the ground in the market across the ocean. Please don’t hesitate to contact Innovation Quarter. Ontwikkelingsmaatschappij Oost-Nederland NV (Oost NL) zoekt ervaren investmentmanagers (32 - 40 uur) voor onze business unit Capital team Tech (en innovatieve maakindustrie). Je bent ondernemersgericht, vindt nieuwe technische initiatieven en producten boeiend en wil samen met ondernemers succesvol zijn binnen de maatschappelijke doelstellingen van Oost NL. Je houdt rapportages bij m.b.t. de voortgang van nieuwe en bestaande investeringen. Ons doel is een bijdrage te leveren aan oplossingen voor maatschappelijke uitdagingen. Wij investeren daarom in onze economie en werkgelegenheid in Gelderland en Overijssel. Oost NL helpt ondernemers in Gelderland en Overijssel te innoveren, investeren en internationaliseren. 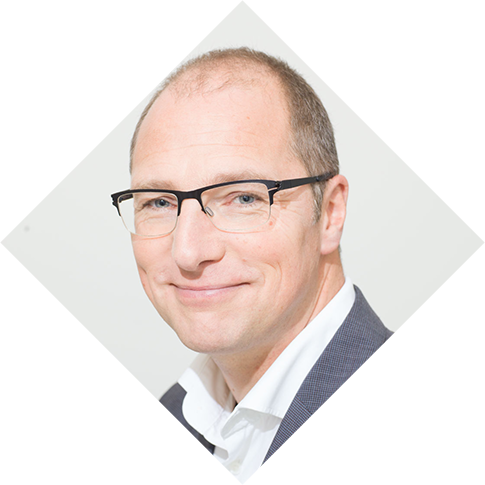 We doen dit door samenwerken en kennisdelen tussen ondernemers te stimuleren, innovatieprojecten te begeleiden, (buitenlandse) bedrijven aan te trekken, campussen, open innovatiecentra en fieldlabs te ontwikkelen en risicodragend te investeren in kansrijke en innovatieve ondernemingen. Salaris: Het bruto maandsalaris voor een ervaren investment manager is uiteraard afhankelijk van relevante kennis en ervaring deze ligt doorgaans tussen de € 5.100,- en de € 5.800,-. Neem dan gerust contact op met Joris de Theije (teammanager Tech): of 06 - 50 25 39 56 (eventueel via WhatsApp). We nodigen je van harte uit om voor 14 april 2019 te reageren. Je kunt hier je CV en motivatiebrief hier uploaden. It was the pedometer that gave him away. Tennis coach Mark de J. was suspected of killing entrepreneur Koen Everink. De J. claimed that at the time of the murder he was being held in a back seat, but his pedometer told a different story. Just one example of digital evidence helping to solve a case. Hans Henseler and Carl Tinker of Magnet Forensics expect this type of information will in future be part of all police investigations. It is therefore high time that not only digital forensics specialists but also regular investigators had the opportunity to review digital evidence. Magnet’s intuitive assessment tool – Magnet REVIEW – makes this possible. What makes Magnet Forensics so innovative? In 2018, the Canadian company Magnet Forensics acquired the product Tracks Inspector as well as the team of the Dutch firm that went by the same name. Tracks Inspector had, among other things, developed the well-known chatbot Sweetie for researchers at Terre des Hommes. With Magnet Forensics, Tracks Inspector has now become Magnet REVIEW. How has InnovationQuarter contributed to the establishment of Magnet Forensics in The Hague? So, the company decided to settle in The Hague. What is the social impact of Magnet Forensics? Magnet Forensics began life on the work floor. The Canadian police officer Jad Saliba, who himself has a background in IT, was disturbed by the fact that his colleagues worked so little with digital evidence. Digital specialists were overloaded and investigators had not mastered the complex digital forensics tools that were available. Saliba therefore built a tool that allowed non-technical colleagues to analyse digital evidence. His company, Magnet Forensics, now employs 220 people. But in his heart, Saliba is still a law enforcement officer with a strong social mission: seeking justice and protecting the innocent. Magnet Forensics were the winner of the NCCC's Business of the Year Award in 2018, presented by Canadian Ambassador Sabine Nolke. PSV will join forces with some big Dutch companies next summer to start an innovative co-operation. ASML, Philips, High Tech Campus Eindhoven, VDL Group and Jumbo Supermarkets will commit themselves as premium partners of PSV under the name of Metropolitan Region Brainport Eindhoven. They will collaborate in the field of innovation, vitality, entertainment, development and recruitment of talent. All parties share the ambition to put the Eindhoven region on the map as global leader in knowledge, high-tech development and innovation. “This is a first in the history of top sport. 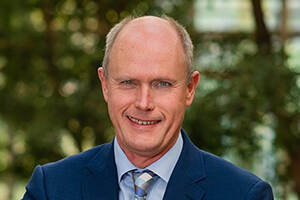 We will create a new ecosystem and the way we will do it is characteristic of the interconnection in this region”, says PSV General Manager Toon Gerbrands. Brainport Development is a Patron Member of the NCCC and is the economic development company of the Brainport Eindhoven region. Op vele manieren werken wij aan de toekomst van Zuid-Holland. InnovationQuarter hebben op dit moment maar liefst 6 open vacatures, in uiteenlopende werkgebieden. Are you a tech-savvy company, start-up or geek? Are you interested in learning about the North American tech market? Then this entrepreneurial trip to Toronto, organised by NCCC member Handelsroute, might just be for you. Of course, there will be an additional program as well as visiting Collision. This program will consist, among other things, of company visits and network activities. Van 20-23 mei vindt de snelst groeiende tech conferentie van Noord Amerika plaats in Toronto. Handelsroute.nl zal een ondernemersreis organiseren waarbij deze tech conferentie centraal staat, maar waar ook netwerkevenmenten, individuele introducties, marktentree informatie en bedrijfsbezoeken op het programma staan. Deze tech conferentie brengt meer dan 25,000 deelnemers uit 120+ landen bij elkaar. De eerste 100 sprekers zijn inmiddels bekend. De tech conferentie brengt CEO’s, startups, multinationals, investeerders en de media samen. Voor registratie kunt u contact opnemen met handelsroute.nl. The Netherlands Foreign Investment Agency (NFIA), part of the Dutch Ministry of Economic Affairs and Climate, is offering a 6-month internship position at the Consulate-General of the Kingdom of the Netherlands in Toronto. The intern will support the Country Director and Assistant Director in their lead generation and project management efforts through key activities as well as provide a context to complete an internship assignment. You will contribute to research and potential business opportunities regarding the superclusters here in Canada and how the Netherlands can benefit from these through Foreign Direct Investment. This will result in an enhanced understanding of the European investment climate while informing Canadian companies about the strengths of the Dutch investment climate. In doing so, you will closely communicate with colleagues in the NFIA network in the Americas, as well as with the NFIA headquarters in the Hague and our regional partners in the Netherlands. For more information, visit the NFIA website. Canuck and Accuflex, a CETA success story: It is just the beginning! 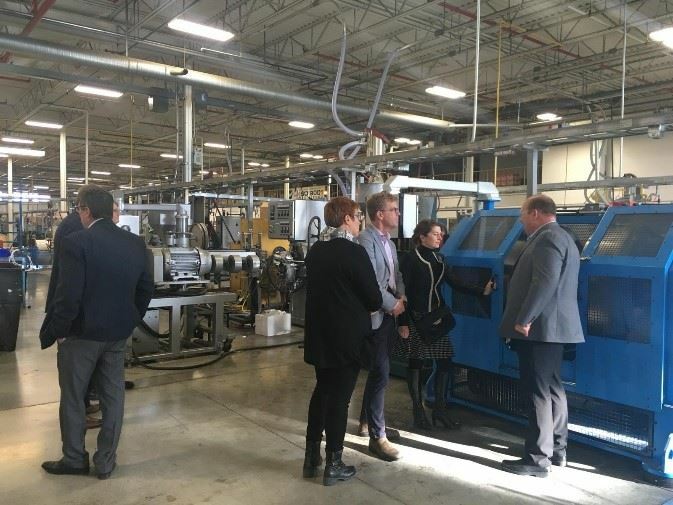 On Tuesday December 4th, the Consulate-General of the Kingdom of the Netherlands and the Netherlands Foreign Investment Agency (NFIA) visited the plant of Accuflex in Guelph, Ontario. This visit was to celebrate the collaboration between the Canadian company Accuflex and NCCC Member Canuck from the Netherlands. 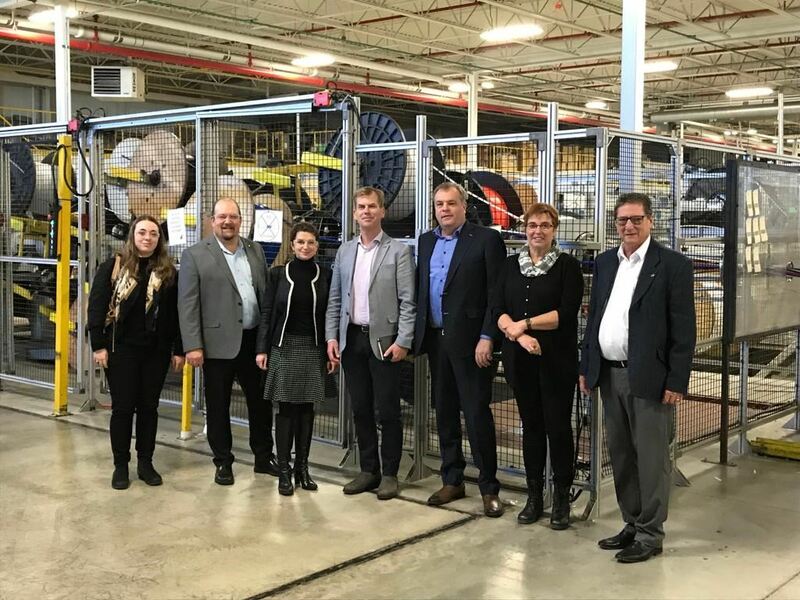 Consul-General Anne Le Guellec and Director NFIA Jaap Slothouwer, along with delegates from Global Affairs Canada and the City of Guelph visited the facility of Accuflex. In the morning the group attended presentations of Canuck and Accuflex about their collaboration and the positive impact CETA has on their cooperation. After enjoying a lunch, Greg Eston of Accuflex and Don Paauwe of Canuck showed guests around the facility and explained the production process. Accuflex is a leading edge thermoplastic hose and tubing manufacturer and uses raw materials from the area. Accuflex provides a flushable dual barrier system that protects beverages from cross-tastes and other off-tastes. Canuck is the Dutch market leader for dispensing equipment for beverages. In Canada, usually the core business is in soda and in Europe the focus is more on beer. The market has changed and new beers make the high quality tubes preferable. Accuflex is delivering its products in Canada and in the US. Canuck is working mostly in Europe and in the Middle East. Canuck and Accuflex deliver products of high quality and for the long term. Canuck has the connections and the good reputation in the business and Accuflex provides for the high quality of services and products. The implementation of CETA has facilitated this cooperation. This partnership has been mainly established due to the direct benefits of CETA. The cooperation between Canuck and Accuflex is a true CETA success story. Canuck was interested in working with Accuflex as it gave the Dutch company easier access to the to North American market. Accuflex was interested in Canuck as the Dutch business can help the Canadian company to conquer the European market. The Netherlands is also used as a gateway to Europe. Both businesses occupy an unique place in the market and benefit from each other and can expand thanks to CETA. Accuflex tried to established itself in Europe a few years ago, but with the tariffs and trade barriers of that time, their prices were too high to be competitive on the European market. Now thanks to CETA tariffs and trade barriers are not an issue anymore and Canuck and Accuflex can easily work together and exchange their knowledge and network. CETA makes the cost aspect more attractive for the European market. Accuflex is now competitive in Europe and both businesses currently also focus on being more sustainable. Accuflex and Canuck have been working together for 20 years but it is only with the introduction of CETA that they decided to intensify their cooperation. For Accuflex it is now easier to compete in the EU market and for Canuck the North American market is easier to access. Both businesses stated that this is just the beginning of their cooperation. The fabrication takes place in Canada but in the future they are not excluding the idea of opening another production site in Europe. This is only an example of the possibilities facilitated by CETA. Accuflex and Canuck help with providing more jobs in both countries, more profit and they are both expending in Canada and in Europe. Accuflex will help Canuck to gain a stronger foothold in the Canadian market. Canuck will help Accuflex to expand its activities in Europe. Besides, the American market is also more accessible for both businesses as the pieces are made in Europe, assembled in Canada and then shipped to the US. Canuck and Accuflex are working together and expanding into the European, the Canadian and also the American market. The companies pointed out that Canadian businesses are less aware of CETA than European companies, probably because of their (main) focus on the US and on the USMCA. That is why sharing this success story is helping raising awareness of the benefits of CETA. Term Details: This position is a LES (Locally Engaged Staff) position, subject to the Terms and Conditions of Employment for LES in Belgium. Working in the international business development team of The Embassy of Canada to Belgium and Luxembourg in Brussels, Belgium, under the general direction of the Commercial Counsellor, the incumbent is an investment officer acting as the focal point responsible for liaising with companies based in the BENELUX territory to facilitate Foreign Direct Investment (FDI) in Canada. The incumbent is responsible for the facilitation of large scale greenfield and expansion investments in Canada. Bachelor’s degree from a recognized university in a field related to the position, including but not limited to Commerce, Finance or Economic. *NB. Communicate effectively in French and in English is considered to be the equivalent to C1 level per the Common European framework of reference for languages. **NB Communicate effectively in Dutch is considered to be the equivalent to B2 level per the Common European framework of reference for languages. • A minimum of five ( 5) years recent* professional experience in business development or foreign direct investment attraction. *Five (5) years recent experience being defined as within the last eight (8) years. • Experience in using social media tools for promotion and/or to generate new business opportunities. • Knowledge of the factors that influence investment, expansion and relocation decisions, and of Canada’s value proposition for investors; Knowledge of trends and recent developments in the Canadian and BENELUX economy. • A graduate degree from a recognized university (Master or Doctorate). Must be able to work overtime on short notice or on occasion to attend events outside normal working hours (i.e., evenings and weekends). Candidates must have a valid work authorization covering the entire employment period. If the employment is indeterminate, the work authorization should be permanent or itself lead to a permanent work authorization. Before an offer of employment can be made, candidates must provide a local address as proof of residence in Belgium so that if selected, it will appear on the offer letter. Candidates who hold visas, electronic A-cards or non-renewable documents, such as student visas, cannot apply for this job, unless they are exempted from the obligation to obtain a work permit. Documentation proving your citizenship and allowing you the right to work in Belgium is required upon applying. A reliability rating (security clearance) is required to obtain this position at the Canadian Embassy in Brussels and will be subject to audits. This rating must be maintained throughout the employment - loss of the latter employment is sufficient reason to dismiss the employee. Candidates must be admissible for travel abroad. Please follow the link http://wfca-tpce.com/vacancyView.php?requirementId=2684& and complete the online application form. Candidates are also required to upload a cover letter and CV in English or French. Candidates are also required to upload any document (i.e. copy of passport, proof of identity with photograph issued by the authorities of a State or other document) proving that they have legal right to reside AND work in Belgium upon applying for the position. Our application tool allows candidates to upload two documents only: the cover letter and the CV. Please make sure to include a copy of your citizenship document and the document proving that you have legal right to work in Belgium at the bottom of the cover letter. Applications which do not include all of the requested documents or information will be rejected. Paper applications or applications directly sent by email to RSCEMA.PERSONNEL@international.gc.ca are not accepted and will not be taken into consideration. This selection process is open to candidates who, upon applying, can legally reside and work in Belgium, who meet all the essential criteria mentioned and whose applications are received on the closing date. Please note that the Embassy of Canada to Belgium does not sponsor work authorizations directly or indirectly. The Government of Canada applies the principles of equal opportunity under the Charter of Rights and Freedoms of Canada. See “conditions of employment” and “important notes” sections for additional details. • Only applications submitted in one of the official languages of Canada will be accepted (English or French). • Proof of educational qualifications will be required during the process. • The Embassy of Canada in Belgium does not reimburse any travel costs to and from interviews/exams nor does it reimburse any relocation costs. • The results of this recruitment process may also be used to establish an eligibility list of qualified candidates for similar openings at the Embassy of Canada in Belgium which might arise in the 12 months following the completion of this recruitment process. Bedrijven en instellingen uit de Nederlandse tuinbouwketen onderzoeken de mogelijkheid om een onderzoeks- en demonstratiecentrum te ontwikkelen aan de Dalhousie University in de Canadese provincie Nova Scotia. De universiteit is initiatiefnemer. De Nederlandse ambassade in Ottawa is nauw betrokken bij het tuinbouwcentrum, iHort Hub genaamd. De iHort Hub aan de Dalhousie University moet de ontwikkeling in tuinbouwsector in de oostelijke provincies van Canada – New Brunswick, Nova Scotia, Prince Edward Island en New Foundland & Labrador – een impuls geven. De overheden en het georganiseerde tuinbouwbedrijfsleven in deze Canadese regio willen graag de Nederlandse tuinbouwketen bij de opzet van dit centrum betrekken. De betrokken partijen tonen veel waardering voor de technologische en teeltkundige innovaties in de Nederlandse tuinbouw. Afgelopen jaren is geprobeerd om een cluster van Nederlandse bedrijven te vormen, met financiële steun vanuit het RVO-programma Partners for International Business (PIB). Opzet was om gezamenlijk actief te worden in Canada. De vorming van het PIB-cluster is uiteindelijk niet gelukt. Wel zijn in die periode stevige contacten gelegd tussen de Canadese en Nederlandse tuinbouwketen. NCCC Patron Member Priva, is een van de bedrijven die belangstelling heeft om deel te nemen aan de iHort Hub. Priva is een Nederlands familiebedrijf dat wereldwijd installaties voor klimaat- en procesautomatisering aan glastuinbouwbedrijven levert. Het bedrijf is al dertig jaar actief in Canada. Jan Westra van Priva constateert dat de tuinbouw in Oost-Canada achterloopt op die in andere delen van het land. Volgens Westra ligt de focus van het toekomstige tuinbouwcentrum op onderzoek en op demonstratie van succesvolle tuinbouwtechnologieën. Samenwerking tussen Canadese en Nederlandse kennisinstellingen, bedrijven en overheden in de iHort Hub kan volgens hem bijdragen aan de ontwikkeling van de Canadese tuinbouw.